McClurg's Marginalia – Page 22 – Where an English Teacher Englishes. By now, you should have read “Berenice” and any number of other Poe tales. Feel free to work ahead of the assignments and to reread. Poe demands rereading! Also, be sure you are working on the How to Read Literature book. You do not want to wait until the last minute to make the chart. This book, in many ways, will introduce you to how we read in AP Lit and should help you with Poe, too. Remember that there will be tests on these works when we get back to school! Now, one more thing before your assignment. Think about how this rhetorical device—antithesis—can also be used to get at larger ideas of theme and image in “Berenice.” Think about how Egaeus and Berenice are opposites. How Berenice is beautiful, but becomes, well…something else. Also, how all these dichotomies create an odd balance in the story that is toppled by Egaeus’s monomania, his fixation on a single idea or image. And I know there’s even more in the story that I haven’t thought about and I’ve read this story something like ten times! That’s the “horrible beauty” of this stuff, folks! Feel free to post your paragraph on the AP Lit Facebook page or in the comments section of my blog. It will be too long for Twitter! Edgar was an odd little boy. Only eight, he seemed eighty. Other boys his age played in the forest, but he chose the graveyard. The living trees that rose from the ground and the activity their presence produced, the constant chirp of birds, the squirrel run-and-chatter, bored him. He enjoyed the concrete and marble rising from the ground, a forest already cold and dead as it grew. He found the woods too humid and oppressive, but he was able to cool his forehead and his thoughts on the smooth tombstones. In the woods, life was noisy and raw, beetles eating trees, birds eating beetles, bobcats eating birds, while the graveyard was quiet and orderly. You didn’t hear or see the worms eating below. Little Edgar took comfort in the abstraction of names and numbers around him and began to write stories using the beginnings and endings he was provided on each grave. For years, I’ve taken to reading an author’s works in chronological order. The better I get as a reader, the more this practice provides benefits. Reading an author’s first novel allows one to see how the artist develops style and that elusive idea we call “voice.” First novels often clunk, but they clunk in an invaluable way for a reader, especially if that reader is also a writer. Over the past year and some change, a friend and I have been reading Kurt Vonnegut, Jr.’s novels in chronological order. I had only read Slaughterhouse-Five, Timequake, and “Harrison Bergeron.” For some reason we focused on the novels. At some point, I need to go back and read his short fiction. I have a feeling there are some keen stories tucked away in there. “How is it that from beauty I have derived a type of unloveliness?—from the covenant of peace a simile of sorrow?” That’s Poe in “Berenice.” And while he wasn’t talking about lists, for me, he could have been. I love lists. I hate them. They are practical. They are useless. And by lists here I mean “best of” not “grocery.” So, here are some Vonnegut lists (with brief comments—no spoilers!) in all their horrible beauty. Slaughterhouse-Five is the book and it deserves all the praise it gets. Vonnegut pulls off what he shouldn’t be able to pull off in this book. I would love to “read against the grain” and nominate another work, but I’ll go even further and say this is his best written novel, too. If you’re going to read just one of his books, this is it. It’s been a while, but it seems to me that Mother Night is like Vonnegut’s “literary” novel. Reading chronologically, it comes after two (for the most part) sci-fi novels, and seems like an odd duck. I want to say that Slaughterhouse-Five’s style is almost a blending of the postmodern sci-fi of Sirens of Titan and the “quiet,” literary style of Mother Night. This book is also the most successful of the “jailed narrator” books, which include Jailbird and Hocus Pocus. I don’t even know if Timequake is a novel, but I love it. Vonnegut seems to have used this novel, remains of a “failed” novel, as a piece to meditate on his life. Alternately beautiful in places and curmudgeonly in others, this book also seems to serve as a love letter to his family and friends. The last three here will probably be listed in different orders on different days. Player Piano is important as his first novel and has some of the aforementioned clunk, but, in my opinion, in some ways, including plotting, more solid than his follow-up novel Sirens of Titan. Player Piano is surprisingly straight (for Vonnegut, that is), but still witty. His second book, Sirens of Titan, is interesting because it begins in the style of “Vonnegut.” His mature style and voice are already present by his second novel, but Sirens is still in many ways a novel of transition. Some of the problems are easily overlooked because this book is incredibly fun to read. Bluebeard is by no means Vonnegut’s best novel, but I have to say I loved it. If we excluded Timequake—(if I could figure out exactly what genre it belongs to—sci-fi/ memoir? magical realism/autobiography?) I would have to say that it is my favorite novel after Slaughterhouse-Five. As a student of art history, I may have enjoyed this fake autobiography of an abstract painter more than most. Most of my friends have told me that Breakfast of Champions is their favorite Vonnegut novel. I found it extremely disappointing, especially after Slaughterhouse-Five. I felt it was a lot of Vonnegut performing “Vonnegut.” Certain devices, such as the drawings, seem forced. Admittedly, it’s a fun read in places, but by no means one of my favorites. But, I’m the only person that I know who has that opinion, so I encourage others to read it for themselves because I may be missing something with this book. We’ve decided to wrestle with Papa next. I’ve read all the short stories, but only a few novels. In the midst of new baby, new house, new life, and new writing projects, I decided to enter a haiku contest for the Centennial National Cherry Blossom Festival in Washington, D.C. Some people may smirk at the form, but I’ve been seriously reading and writing in the form for a lot of the year and have found a newfound love for it. The more I learn about it, the more I realize how little I knew to begin with. Anyway, the contest. Well, I won it. And then I wrote for the Washington Post’s blog every day for a week. And then a Japanese newspaper interviewed me. They kindly sent me a copy, but it’s all in Japanese! So below is what may have appeared in the Kumamoto Daily News. Thanks to Amy Hitt at the Washington Post, Reiko Robertson of the Kumamoto Daily News, and to the poet-judges Venus Thrash and Jose Padua! Also, thanks to those little blossoms on those trees. No, but I would love to go. I am a big fan of Japanese film like Kurosawa and Imamura. I am currently reading the stories of Ryūnosuke Akutagawa and I love the book Woman in the Dunes by Abe Kobo. I’ve listened to traditional Japanese court music and I also like more experimental groups like the Boredoms, the Ruins, and Melt Banana. I enjoy learning about the culture, but I’ve never had the money to travel. Have you actually seen the Washington cherry blossoms? I have been to the area, but I saw it in summer and not in the spring. Do you read or speak Japanese? No. I would love to have the time to study the language and to study zazen in Japan. I suppose that you are teaching English at a senior high-school. How long you have been teaching? I currently teach English at Hewitt-Trussville High School. I have been teaching professionally for 6 years. When did you start writing Haiku poems and what was the motivation? I’ve been writing since high school. Around that time, most Americans are introduced to haiku. I’m sure I wrote senryu like most Americans. We call all of these short poem forms haiku. Within the last few years, I’ve really taken an interest in haiku and I intend to read more of the classics of Basho, Buson, and Issa. Many American writers have written interesting versions of haiku. For example, the Beats often wrote haiku in the form of a sentence, rather than a three or four line structure. Since February, I have attempted writing a poem a day. Many times these come out as haiku or senryu. I have a new baby so I have to really work to find writing time. My motivation for turning to haiku is in one sense practical; it’s short. Even though they are short, haiku are not easy to write, by any means. Writing a good haiku is difficult. The haiku, like zazen, forces us to slow down and I think that is very important for us today. Our society does not appear to like us to slow down, to concentrate, or to be in or experience the world around us. Are there fundamental differences in writing Haiku and Sonnet, and if there are, what are they? This is a difficult question! I could write an essay or book on this subject. Or someone more capable could! It is not easy to write a good haiku, just as it is not easy to write a good sonnet. Because of the brevity of the haiku form, it allows easier drafting. The haiku preserves a revelatory sensory image. The image or moment is all. It’s a photograph. The sonnet calls for metaphorical development leading to a thematic insight. Something more like a short film. This visual art metaphor has probably been used before. This is an interesting question and I feel my answer may be inadequate! Is there any group of haiku poets in your area where you can meet regularly and study each others’ works? This is a must in Japan, and haiku poets get support and encouragement from the group meeting. I am not aware of any haiku groups in my area. Writing groups exist, many with a focus on poetry or fiction, but I am not aware of any with a focus on haiku. I know there are some haiku societies in America, but I’m not sure what their goals are or if they even meet in person. I’ve always loved the idea of a group of writers working together, but I’ve rarely seen it work myself. Are your high school students making haiku? What is their interest? I have my students write in various poetic forms, including haiku. Students gain the ability to analyze the forms by writing in them. Hopefully, they also enjoy the creative problem-solving that each form embodies. Most students write senryu that are humorous. A few students see the potential of traditional haiku and write very beautiful and powerful poems. Last night was good for chance cooking. My wife bought tilapia fillets that she then had no appetite for and left them to me. My first thought was to sear each side and make a garlic, butter, and white wine sauce. Serve with a side of some veggies and homemade garlic bread. Simple, but good. Well, she left out some dried wild yam soba noodles on the counter. When I saw them, the dish came together. The wild yam noodles reminded me of these weird, little sweet potato cubes we had in the freezer. Why would anyone ever need such a thing? I hadn’t had the courage to ask, but looking for them I came across some peas (which I like frozen—peas and spinach both) and then I found an open bag of edamame (soybeans). Soba noodles and edamame seemed like a natural pairing. First, I boiled the edamame and sweet potato cubes for about 5 minutes while the soba (in a different pot) went a little longer. Not very long though, since I knew I was going to stir-fry the noodles in a pan later. I love dried pasta to be al dente. That texture is everything to me. I drained all three and kept them in a colander. Next, I breaded the fillets with a little panko and pan fried them with a little butter and bacon fat. Removed them from the pan and left the crunchy bits. Added a little more butter. Added three cloves of garlic (you could add less—-I love garlic). Then added the edamame, potatoes, and noodles. Stir fried for a minute or two and then deglazed with a little white wine. Salt and pepper to taste. Plated the fish on top of the noodle mix. With few expectations going in, this proved a nice dinner. One of my favorites. 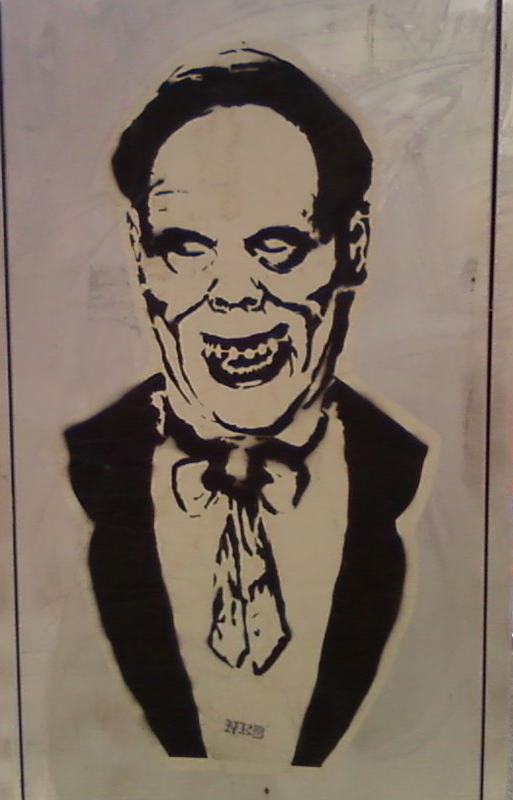 I've seen wheat posters, stickers, and stencils of Lon Chaney's iconic image around town. Good stuff! It might have something to do with the recent movie Exit Through the Gift Shop playing our local festival and becoming readily available on Netflix. The film documents some of the important artists in this relatively young style. I say young because it feels new, even though for me it harkens back to performance art, happenings, dada, and surrealism that have been with us for almost 100 years. Also, I find them linked to the aleatoric or chance music of John Cage or the non-idiomatic improv of Derek Bailey. It appears, happens, speaks, and is gone. Like performance art or live improvisation, the art has a short lifespan unless captured in some way on another medium (funny—I want to say “tape or film” but I don’t think most people use either of these but it sounds weird saying “ones and zeros”—oh well). Conceptual dumpster art. Kanye vs. Taylor. 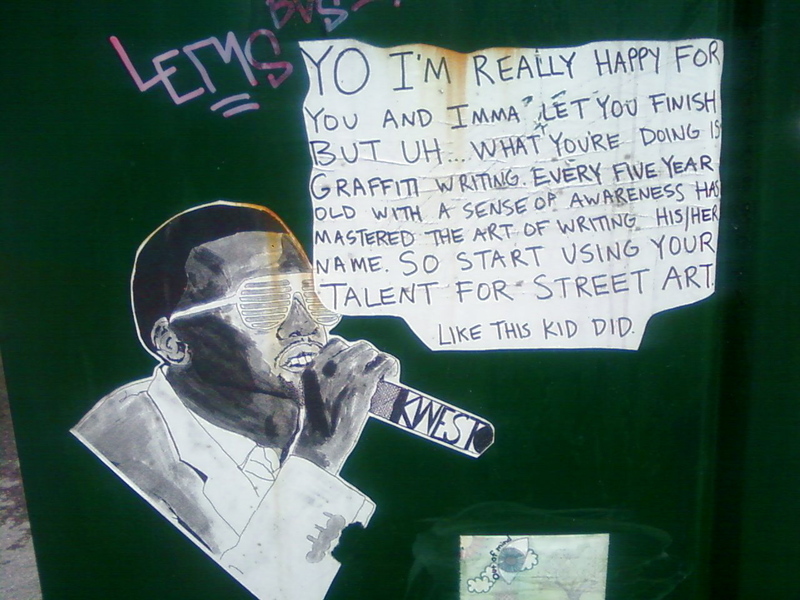 Street Artist vs. Graffitist. Like fight scenes in Beat Street or Breakin' 2: Electric Boogaloo. Wow. 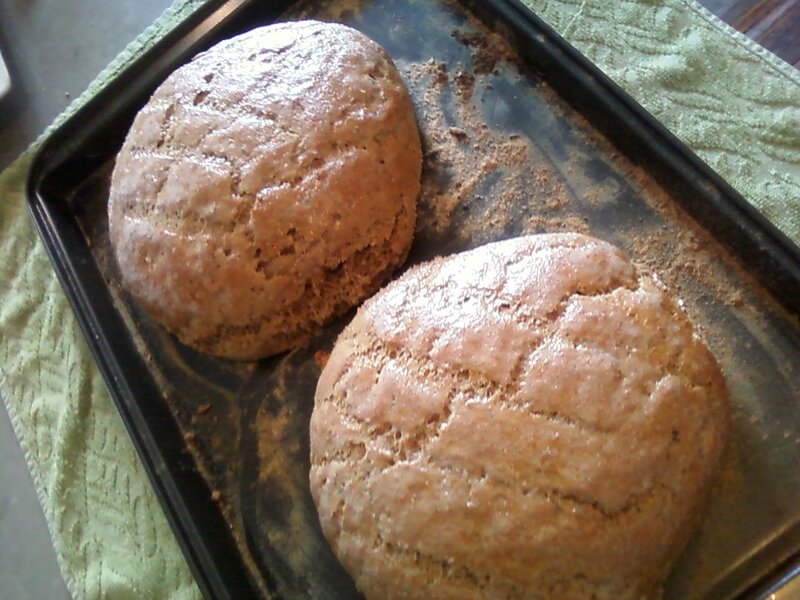 Cottage loaves or Momma Mia, look at those buns! I love the extra cooking time I get in the summer. I’ve made broths, sauces, breads, and sawmill gravy (The only dish besides jambalaya and gumbo that I learned like oral history—these recipes feel different when I make them. Maybe I should explore that in another post…). This week’s output will also include some rolls, French toast (made from aforementioned bread), maybe some pasta and pizza dough. Of course, these are “official” recipes. I improvise a lot in the kitchen and it mostly works. Mostly. It’s like practicing scales on an instrument. The hands and ears work together to help build technique. Cooking technique is similar. How do these tastes/textures/aromas work together? Can they work together? You get better at this the more you cook. Just like you get better at playing an instrument by, yep, playing the instrument. As simple as this idea is, I have had many a good friend who could not grasp this proposition. And I need to start writing down the recipes that work. Otherwise, the good ones are like playing a great improvised solo and forgetting to hit the record button. I had a great recipe for nachos with asparagus tips and some other foodstuffs (Bacon? Black olives? Green onion? Hmm …) Anyway, it was good. I promise. And now I want to make tomato sauce. I used to make it every Friday night. Of course, I never wrote down the refined recipe so it will be like starting over. I know It started with oil, onion, salt, and grated carrots. Yessir, grated carrots. Good for the prostate this sauce was and maybe that’s another post as well.